Many hours of work went into this one, and a lot of planning. 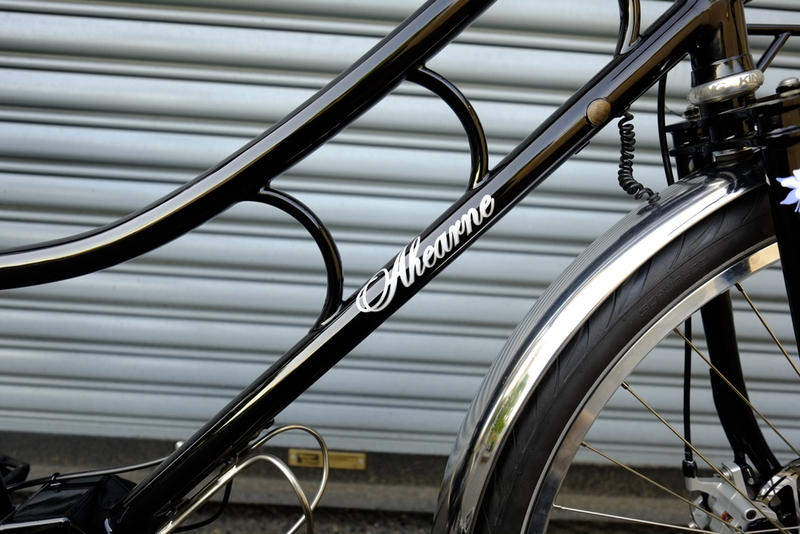 The design of the frame and racks came free-form, after the initial goals for the bike were set. Pinion, Gates Carbon Drive, disc brakes, of course generator and lights, fenders, the ability to carry a little or a lot of stuff. This bike is going to live in Colorado, where the Columbine is the official state flower (check out the fork detail). The bike will likely see use on gravel paths, and so the wide tires were a requirement. Or, in winter change the tires to something knobby for snowy conditions. There's a full set of custom bags made by Black Star Bags, and a steering lock to keep the front wheel from flopping when the front is loaded. The racks have Wenge as a hardwood base. The build was complex, but the hope is that the very low maintenance required for the Pinion and belt drive will make it very simple for Gretchen for years to come. The full run of photos can be seen on my flickr page.